This is the first of the 2 posts today, so be sure to check out both! 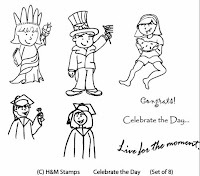 Today is the release for H&M Stamps 2 new sets: Hoo-Rah and Hoo-Rah sentiments. For anyone purchasing both of these sets Heather will be donating $5 to a special military fund. Head over to ----> Her blogto check out all the details! AND...if you remember I had a set of stamps that she donated to give away for blog candy! I pulled the winner last night from a hat...and my DD drew #6...Nancy E who said : My other hero is my hubby who served in the USAF for 30 years. He served his country proudly. So, Nancy send me your info and Heather will get this out to you! OK...bear with me this month...my cute and bright projects WILL be back! But in honor of the Armed forces, and in memory of 9/11 we will have a bit of a salute here this month. Here is my first card for this month using the awesome new sets from H&M Stamps. Heather is releasing 2 stes on the 10th of August...HooRah and HooRah Sentiments...if you purchase both sets $5 will be donated to a special cause in the military...you can read more about it on her blog----> HERE. For this one I focused on the flag image...there are so many different ones to choose from in this set...but I had to start somewhere! I inked it up twice then pieced it back together. I finally had a great use for my last cute star clip thats been hiding out in my stash! I also put together a page using these same stamps. The pic is of Lt McClary who was a motivational speaker at a convention I was at. His story is phenomonal and so is his message. We were all given his book "Living Proof"...the story of a young man full of life and outstanding in sports who went off to Vietnam and lost an eye, an arm, and had 30+ surgeries in order to live. He has since devoted his life to The Lord's message while still serving the military. A true life hero. I have to say also that those of you who have left me stories of your heroes are truly pulling my heartstrings! I won't respond to them all, but I am reading them all. We have all been so blessed by the everyday heroes among whom we live. Who wants some free stamps? Thats right...I have blog candy for you! Heather Rolin, owner of H&M Stamps has been so generous in giving us all a set to give away to our readers this week! In honor of the US and the armed forces who serve our country she is releasing 2 sets this month...Hoo-Rah and Hoo-Rah sentiments. All you have to do is 2 things: first leave me a comment on this post telling me who one of your heros is ...then (this step is optional) head over to Heather's blog for the full story on these sets and to see the details on the other fabulous stuff she has planned for this month...she is donating $5 for everyone who purchases both sets and is also taking donations. Here's the set you can win...I will pick a number using random.org on the 10th...the day of the release...so you have untilmidnight EST on the 9th to enter! This adorable set is called Celebrate the Day and was released back in May. I have 2 posts for you tonight...I wanted to have this one up this afternoon but it didn't happen since we were out of the house like all day. I made you 2 more cards using the "Cozy On Up" set from H& M Stamps. Have I told you just how adorably cute this set is? I just love the little bear in it...I had to try him out with his little head popped up (paper tole technique)...he is so cute!! His thoughts are that he is liking it, total vacation! I used some more of the fun paper from Marcella for this card...I just love that these "earthy" colors are so bright and vibrant! BTW, I used Heather's sketch for this card...sort of!! It is HMSC9 I believe. One more card using this same set that I forgot to post last week. I used my new Diamond cuttlebug folder that someone used then I had to have. Its such a cool look, but I haven't pulled it out very often. I distressed the edges on all the layers and sponged the grass with Olive and the night sky with Eggplant. Turned out a bit blah...I think I need a grass stamp or something....the sponging just didn't do it for me, but I never figured out who to fix it. Oh well. I still think it turned out kinda neat with the colors and panels and such. Heather posted a double challenge for the H&M DT for the weekend and I just now got a chance to get to it thanks to the whirlwind of birthdays! I stuck to the sketch, but the color challenge was Real Red, Only Orange, Yoyo Yellow, and So Saffron...not quite what I ended up with, but hey, a challenge is a starting point for inspiration, right? I ended up keeping the Real Red, but I pulled out the brand-spankin' new Tangerine Tango...what a gorgeous color! I also used Summer Sun, Basic Black, and a touch of Green in the marker color. After I colored in all the starfish I removed a lot of the color with the Copic blender pen so it wasn't quite so bold. You really needed some shades at first for this baby ;) The jumbo starfish is from the H&M set Sea Life, and the mini starfish are from the new H&M set Fun in the Sun...they are a perfect match together!! So what do fishing and scraps and blog candy have to do with each other?? Nothing! But today they are all part of this post! Here's a peek of the fishing page and then on to BLOG CANDY!! I'll tell you more about it below ;) It is time for some goodies for one of my readers...I haven't done any in a while. Please leave a comment on this post (including your posting number) by Friday at 11pm EST. So what do you have to do? Tell me whats on your ipod right now...or what cd have you bought recently? I need some new tunes to download so just give me some suggestions! 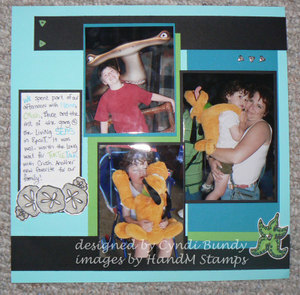 There is a new unmounted stamp set from Stampin' Up! (Sidekick sayings hostess set) , some 6x6 Fall Flowers DSP, a pad of PP from K & Co, a bunch of ribbon and 2 COPIC markers so that you can give them a try!! Now...I am back to the topic of scraps. I know you are sick of hearing this this week...but I am on a mission! I am trying to make cards with pieces from the scrap basket, and I am trying to force myself to use scrappin kits that I ordered way back when that have just sat there. For this page I picked a kit. Actually I picked the kit and told myself that I WOULD use it no matter what. I wasn't really fond of the copper sticker letters or the chipboard pieces or even the patterns on the PP...too blah for me. so I had to head off to my pics to see what might work. What I found was a pile of pics from Rachael's camping trip last summer with the Greene family. These 2 pics were the right color for this page so I went from there. The large circle was PP already in that shape which made that easy-peasy!! did you notice that I actually pulled out the trusty old sewing machine for this one?? <<Gasp>> I think it may live on the table for a while so that it gets used more often. Its not that I don't like to sew on my pages or cards...the monster just takes up too much space in an already cluttered room. Then all I did was use the pieces that came in the kit and add a bit of jornaling. Then I remembered the fishing rod in the new "Cozy on Up" set from H & M Stamps. Tada!! Just what it needed :) Thats it for now. I will have some CC Designs cards for you tomorrow and I may sneak in a bit of Unity tonight...my last order just arrived! Just looking at all that ice cream kinda cools you right off, yeah? Ha, I wish!!! Still blazing hot down in NC, although we have finally had a lot of rain this week. The stamps are again from the must-have go-get-it-now Fun in the Sun set from H & M Stamps. I had fun making the background for this (but I wouldn't necessarily advise it)...I used the SU! Polka dot background stamp and inked it up with all 4 colors in markers...the counting of dots was not so fun. But the result made me very giddy!! I wanted a multi-coloredd dot paper and it worked!! I also like the way the ribbon is tied through the button...i have been meaning to try this, but you have to have a really narrow and thin ribbon! Overall I just LOVE the way it turned out!! H & M Stamps New Release is today!! Today H & M Stamps is releasing 2 adorable new sets, Fun in the Sun which I gave you some peeks of already, and Cozy On Up....which I have 2 cards with today! I haven't done any camping since my girls quit scouts last year (insert sigh)...but I do have many fun memories of camping, campfires, and smores!! This set has a ton of fun images and will coordinate great with the set that Heather released a couple of months back: Dad's Outdoors. for the first card I used a skecth from SCS from a couple of weeks back. I stamped the campfire and 2 sets of marshmallows. I later thought...wouldn't it be fun to add some white liquid applique to the marshmallows and then heat it until it looks burnt?? I may have to try that! This was a really easy card once you figure out the size of the little squares...but I thnk the color turned out fun!! For my next card I wanted to try a baby card with the cute bear. He turned out pretty cute, but I think its the sentiment thats just not right. Maybe for a grandma to send to a little boy?? I even tried doing 2 of him, but it didn't work with the colors I chose...I'll try that again!! He is simply adorable though!! I think he will be lots of fun to play with again and again!! I am back on previews for a couple of days!! Here are 2 more cards done with "Fun in the Sun", coming to you from H & M Stamps on the 10th!! I just love all the fun little images that Heather has packed into one set!! There are 19 of them :0 She has outdone herself with adorable sentiments as well in this fun set! For the first card I used Julee's Mojo Monday sketch from last week. I used the cute little shells for the trio of embellishments at the bottom...I think that turned out kinda fun! I also exacto'd out the centers of the shovel and pail so that I could hang the shovel on the handle...what was I thinking?? But it turned out cool so it was worth it. For this card I used Heather'ssketch for the week HMSC2...but I cheated...I flipped it on the side so that the circle was at the bottom. I have been dying to use this fun Imaginesce paper that I got from ATS last week, and I think it was just perfect for this set! I used the fun little sand castle for the first time on this card...I love this image! I just wish our castles looked anything like that when we build one!! Again, a pretty easy card, not a ton of embellies...the wild paper was plenty :) I cut the circles with my curvy cutter, which obviously needs a new blade, so I had to distress it a bit so it looked intentional, KWIM? Some notes first: Have you seen the new Verve forum over at Splitcoast stampers?? If not, go check it out! Julee is offering FREE shipping though July 15th and there is a great contest as well...you could win Free VERVE bucks!! Woo hoo!! I will be starting the week of peeks from All That Scraps in a couple of days...so stay tuned for that! 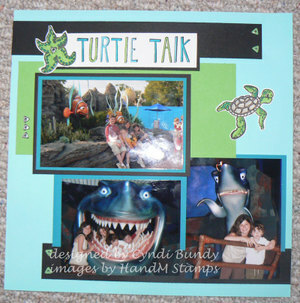 But, today I have a sneak peek for you from a fun (and pretty new) company called H and M Stamps. All of Heather's sets are clear acrylic. These images are both from a new set coming out on the 10th of July called Fun in the Sun. I used just 2 of the 19 (yes I said 19!!) images in the set :) Talk about a great value! I have some news that I have been sitting on for a few weeks...I have been asked to be one of the Guest Designers for H & M Stamps for July and August!! I am super excited, Heather has some really awesome sets so far, and she has just opened for business a couple of months back. I needed to copy some photos for one of my friends that I went with, so I wanted to make a card to send along as well. The last thing out dolphins did was to jump for us, all three together. I tried doing 3 dolphins on the card, but it looked kinda wierd, so I went down to 2. They are colored in with copics.